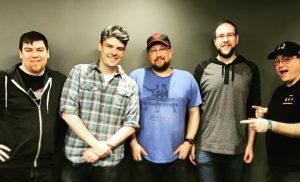 Founders Adam Davis and Adam Johns returned to the Board Game Alliance Podcast, recorded at the KISW station here in Seattle. They shared some stories about Game to Grow’s use of role-playing games like Dungeons and Dragons in therapeutic social skills groups! You can listen to the episode at the Board Game Alliance website or on iTunes. Game to Grow appears at 26:50. Big thanks to the crew over at BJ Shea’s Geek Nation and Board Game Alliance for having us on!